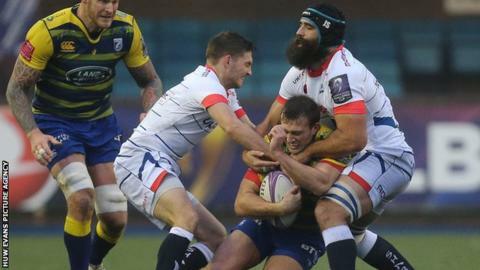 Cardiff Blues earned a third win in four Challenge Cup matches with a hard-fought victory over Sale. Blues were looking to bounce back from their 24-0 defeat by Sale and managed to do so in wet and wild conditions. A try by Matthew Morgan set them on their way after an even first half saw the sides locked at 3-3. The reliable boot of Gareth Anscombe ensured the victory, with two booming second half penalties making all the difference at the Arms Park. Blues suffered a blow even before kick-off, with captain Gethin Jenkins ruled out by a late fitness test as he failed to shrug off calf and knee issues. Jenkins had been named as one of six changes. The visitors made nine changes for the return fixture as Sam James started at fly-half for the first time this term. Sale director of rugby Steve Diamond returned for the first time since he was given a six-week stadium ban. A poor first half saw both sides limited to a penalty apiece, with Gareth Anscombe opening the scoring before Will Cliff replied in kind just three minutes later as the wet conditions dominated proceedings. However, Blues seized an advantage just over the break when Morgan crossed after Anscombe's pass, though the angled conversion attempt was missed, before a 40-metre penalty attempt more than made amends. Cliff again reduced the arrears with his boot, but Anscombe ensured there was to be no grandstand finish with a penalty of his own after man of the match Josh Navidi was impeded. Cardiff Blues coach Danny Wilson told BBC Sport Wales: "It was tough conditions, we played them poorly last week... but we did it far, far better today. "We played some rugby in the right places. It is pleasing." Cardiff Blues: Morgan; Lane, Smith, Halaholo, Summerhill; Anscombe, T Williams; Thyer, Rees (capt), Peikrishvili, Davies, Welch, Cook, Navidi, N Williams. Replacements: Myhill, Domachowski, Assiratti, Down, Turnbull, L Williams, Evans, Lee-Lo. Sale Sharks: Haley; Solomona, Jennings, Van Rensburg, Charnley; James, Cliff; Flynn, Jones, Aulika, Evans, Nott, Neild, Ioane, Strauss (capt.). Replacements: Webber, Harrison, Tarus, Postlethwaite, Curry, Sturgess, James, Odogwu.